An early morning haze is lingering over the Cotswold hills, the sun not yet high enough to burn the autumn moisture from the air. There is the odd flutter of wings between the trees, but nothing else to disturb the stillness as Kenny Hibbitt prepares to tee up. Without even bothering to go through the motions of a practise stroke, he addresses his ball. One elegant swing later and his drive is flying straight as an arrow down the middle of the first fairway. It is a hard act to follow, but the former Wolves midfielder is the easiest company over the next three hours as we plot our way around the stunning Cotswold Edge Golf Club, his home track. Hibbitt was a central figure during the last period of time Wolves could be regarded as a force in English football. A midfielder in the mould of Frank Lampard, between 1968 and 1984 he made 574 appearances, placing him second on Wanderers' all-time list. The club's fourth-placed finish in the 1970/71 First Division season would earn a Champions League place these days but back then it was qualification for the UEFA Cup. It was one of three top-six finishes for Wolves over the next ten years, which also included two League Cup triumphs and a UEFA Cup final. Hibbitt's enthusiasm for sport rubs off immediately. He may be aged 67, but the competitive edge that helped make him one of the Black Country club's greatest players remains. A two-handicapper, he reveals that it was during Wolves' time in European competition during the early 1970s that he learnt the game of golf, when then-manager Bill McGarry took him for a game on days off after European midweek fixtures. Hibbitt also represented Yorkshire schoolboys at cricket and counted the former England wicketkeeper David Bairstow amongst his peers. But it was football that won out in the end, as he followed the path of his older brother Terry into the professional game. "As kids we played this game, long shots, stood 20 yards apart where we drilled balls at each other and we both had goals to protect," he explains. "We just did it for hours and hours and hours. It all started there really, we were just totally focused on trying to make it as footballers. There were three years between us and when he went to Leeds at 15 I was just 12 and still at school." Hibbitt junior got a move to Bradford Park Avenue as an apprentice when he too reached the age of 15, before Wolves came calling with a £5,000 transfer fee two years later. 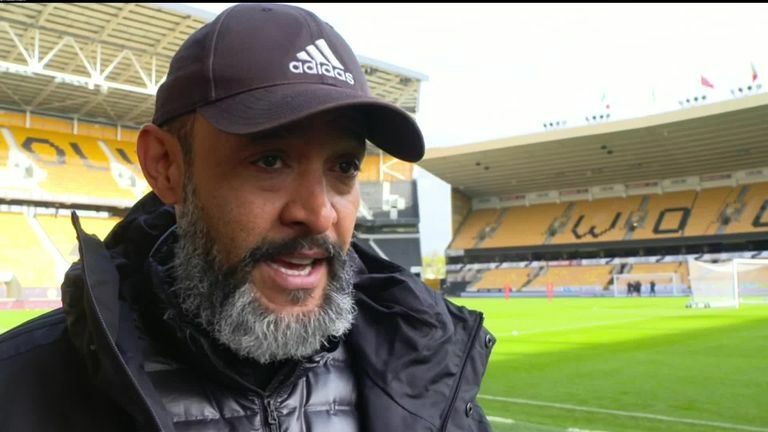 Now he is looking on as a supporter at a Wolves side that, for the first time since his playing days, is comfortably holding its own at the highest level in England. Not even two successive defeats have punctured the optimism, with Nuno Espirito Santo's side currently occupying a top-ten place. "I think those that were there in the Seventies are going to see it again," Hibbitt says. "The younger ones who haven't seen the success we had in that era, they're about to see something special. The present set-up is something we never thought we'd see, with the owners [Fosun] coming in with the targets of getting to the Champions League and more." Hibbitt's own European adventures peaked with a famous all-England UEFA Cup Final against Tottenham Hotspur in 1972, which Wolves lost over two legs. "That was a fantastic period. As a young boy the furthest I ever went was Blackpool and Morecambe for the day," he recalls. "But there I was on these aeroplanes travelling all over Europe and going behind the Iron Curtain. It was an experience for us as we had quite a few youngsters in the side. We were young lads learning not just about football but about life as well. "We went to Juventus who had the great John Charles and he took us around Turin. That was an education, things like that. Maybe people take that for granted now, but I was thinking, 'How lucky I am', it was massive for me." The two League Cup triumphs in 1974 and 1980 would help make up for the one that got away, but one of Hibbitt's most memorable moments came in the FA Cup in April 1981, also against Spurs. With Wolves trailing the semi-final 2-1 at Hillsborough, referee Clive Thomas gave one of the most controversial penalties in the history of the game. Hibbitt smiles. "People don't talk about the other 89 minutes, they never talk about my goal. Nobody mentions about the knock-down from Andy Gray and my volley into the bottom corner with my left foot, it's always that 90th minute! I'd run all the way from our half and made my way into the box. I went past Steve Perryman and was ready to pull the trigger. Then Glenn Hoddle came in from the side, slid in and put the ball out for a corner. "There was this massive cheer and I thought, 'That's a hell of a cheer for a corner', then John Richards came up to me shouting 'Hibby, Hibby, get up, it's a penalty!' I was so surprised that Clive gave it. Glenn made a really good tackle but it must have looked like a penalty from Clive's angle. We were happy coming out of it 2-2, but I remember all the fuss afterwards." A furore was whipped up in the Sunday papers and Hibbitt had to deal with some unpleasant hate mail from Spurs fans who accused him of diving. Wolves went on to lose a one-sided replay 3-0 at Highbury, with Spurs going on to lift the trophy thanks in part to Ricky Villa's wonder goal in a final replay against Manchester City. "I felt for our fans travelling all the way down from the Midlands to London in midweek and they just had to go across town. I was a bit surprised the FA allowed that to happen, but on the night we didn't play and we didn't deserve to go through." Hibbitt is just one-over par at the end of our front nine. As the course dips into the valley heading west, overlooking the market town of Wotton-Under-Edge, the Severn Vale and across to Wales, the talk turns to the demise of a great club. The season after that infamous semi-final, Wolves were relegated. After a decade of challenging for trophies, they had hit on the hardest times. "Losing that semi-final, we never really recovered from it when you think about it. It was an indifferent time for the club after that and it never really got better. It just went downhill. I put it in the press at the time that if it was me that needed to move on to make way for younger players then I'd accept that. We all grew old together and were never replaced and I think that was the start of the demise." An immediate return to the top flight was followed by a bottom-placed finish in the 1983/84 season, the first of three successive relegations. There was turmoil off the pitch, too, with the club twice going bankrupt and fending off winding-up orders. The ground was closed on two sides for lack of a safety certificate. Hibbitt moved to Coventry City in 1984 but watched on as his old team suffered. "I had two really happy years at Coventry. But I was looking in from the outside and it broke my heart to see them dropping down into the third and fourth divisions." The Molineux of today has changed almost beyond recognition, but Hibbitt still stays in touch with his old club and the golf provides a perfect platform. A recent charity golf day with former players gave him the chance to catch up with old team-mates including John Richards, Steve Daley, Willie Carr and Phil Parkes. Not just to reminisce about old times, but to look forward to a potentially bright future. "We've now got a team that is solid in all departments," Hibbitt adds. "It's great to see the English lads doing well, too, Conor Coady in particular. It's nice to see him getting some recognition. It's so exciting to see Wolverhampton sparkling again." And would he like to play in a midfield with Ruben Neves and Joao Moutinho? "I don't think I'd get in it. You've got Neves, Moutinho, Helder Costa. Great players. I've seen them against Burnley and Southampton and I'd like to see them more often. We've got the slow build-up and then we can attack at pace as well. It's crazy what is happening here now. Wonderful, but crazy as well!"